In Topic 4.1, we introduced the concept of elasticity and how to calculate it, but we didn’t explain why it is useful. Recall that elasticity measures responsiveness of one variable to changes in another variable. 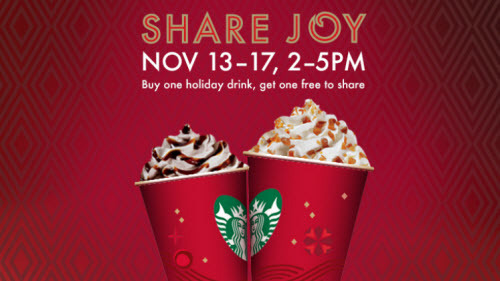 If you owned a coffee shop and wanted to increase your prices, this ‘responsiveness’ is something you need to consider. When you increase prices, you know quantity will fall, but by how much? And It Is Called . . . 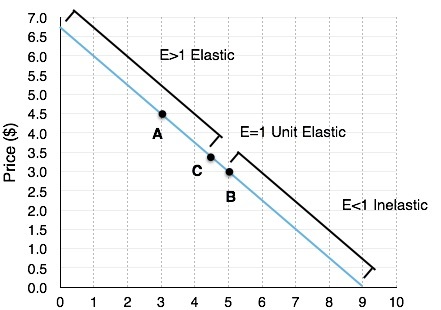 If we were to calculate elasticity at every point on a demand curve, we could divide it into these elastic, unit elastic, and inelastic areas, as shown in Figure 4.2a. This means the impact of a price change will depend on where we are producing. Feel free to calculate the elasticity in any of the regions, you will find that it indeed fits the description. In reality, the only point we need to find to determine which areas are elastic and inelastic is our point where elasticity is 1, or Point C. This isn’t as hard as it may seem. Since our formula is equal to the inverse of our slope multiplied by a point on the graph, it will only equal 1 when our point is equal to the slope of our graph. For a linear graph, this only occurs at the middle point, which is (4.5, 3.325) in this case. So far, we have determined how to calculate elasticity at and between different points, but why is this knowledge useful? When you increase price, you increase revenue on units sold (The Price Effect). When you increase price, you sell fewer units (The Quantity Effect). When our point is elastic our meaning if we increase price, our quantity effect outweighs the price effect, causing a decrease in revenue. When our point is inelastic our meaning if we increase price, our price effect outweighs the quantity effect, causing a increase in revenue. 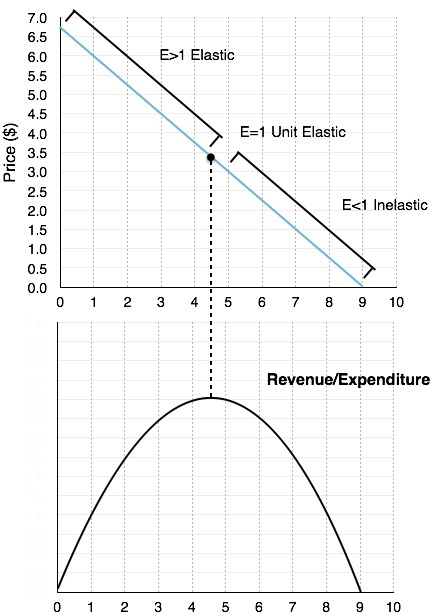 The first thing to note is that revenue is maximized at the point where elasticity is unit elastic. Why? If you are the coffee shop owner, you will notice that there are untapped opportunities when demand is elastic or inelastic. If elastic: The quantity effect outweighs the price effect, meaning if we decrease prices, the revenue gained from the more units sold will outweigh the revenue lost from the decrease in price. If inelastic: The price effect outweighs the quantity effect, meaning if we increase prices, the revenue gained from the higher price will outweigh the revenue lost from less units sold. 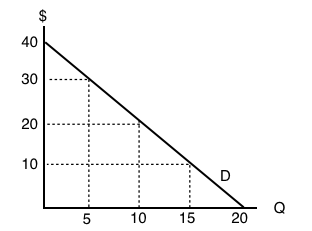 The effects of price increase and decrease at different points are summarized in Figure 4.2c. You will notice that expenditure is mentioned whenever revenue is. This is because a dollar earned by the coffee shop corresponds to a dollar spent by the consumer. Therefore, if the firm’s revenue is rising, then the consumer’s expenditure is rising as well. You must understand how to answer questions from both sides. Elasticity is used to measure the responsiveness of one variable to another. This responsiveness can be labelled as elastic (e > 1), unit elastic (e = 1), and inelastic (e < 1). 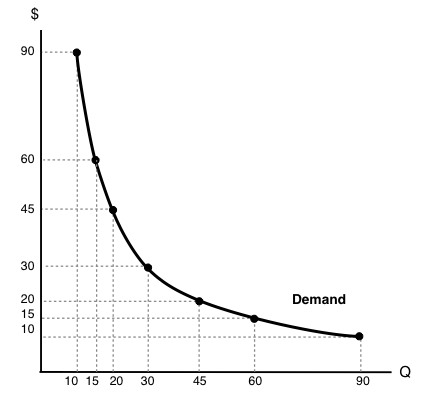 We can apply this to the demand curve, with unit elastic corresponding to the middle of the demand curve (x-intercept/2 , y-intercept/2). Everything to the left is elastic and everything to the right is inelastic. This information can be used to maximize revenue or expenditure, with the understanding that when elastic, the quantity effect outweighs the price effect, and when inelastic, the price effect outweighs the quantity effect. when the elasticity is greater than one, indicating that a 1 percent increase in price will result in a more than 1 percent increase in quantity; this indicates a high responsiveness to price. 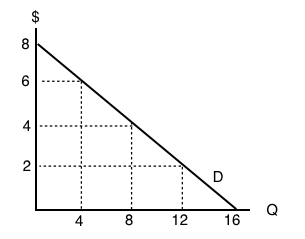 when the elasticity is less than one, indicating that a 1 percent increase in price paid to the firm will result in a less than 1 percent increase in quantity; this indicates a low responsiveness to price. 4.2 Elasticity and Revenue by University of Victoria is licensed under a Creative Commons Attribution 4.0 International License, except where otherwise noted.